The men of the railway saw the steam locomotive as their hope for the future. Their work was hot, grueling, and dangerous, but it gave them the income they so desperately wanted. 1925 Richmond, Virginia was a city still reeling from the Civil War, and clawing its way into a new identity further characterized by industrialization. 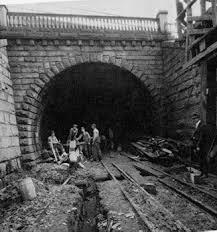 Winding under the city, particularly under an area called Church Hill, was the Chesapeake and Ohio Railway tunnel that had been in place since the 1870s. The tunnel was notoriously dangerous, but in October, after 20 years of disuse, a crew pushed through. In moments the tunnel crumbled around them. Men scrambled for their lives, running through the darkness and dragging their bodies under and over the locomotive toward the sliver of light they could still see. Efforts were made to rescue men trapped inside. 2 bodies were removed, but 2 men listed in the crew were left inside. Rumors swirl that there were potentially many more that went unaccounted for because the Irish were rarely mentioned by name in work crew records. 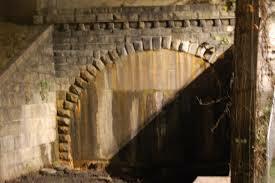 Rescue efforts caused the tunnel to crumble further, and soon it was considered unsafe to continue. The tunnel, with the train and the bodies still inside, was sealed and abandoned. The wrath of those left to work in the tunnel for eternity has not gone unnoticed over the years. Many have reported hearing the sound of a train late into the night, or the scratching of men trying to escape the sealed tunnel. Houses have been lost to portions of the tunnel collapsing further. Whether it was only two men that found their final resting place on the train where they worked, or dozens, the city of Richmond has great reverence for the souls that seem to have never stopped working toward the future.